Local OCC Logistics Coordinator Diane Buhler and her daughter Kirsty made the trip to Dakar, Senegal, where they were able to experience the distribution of shoeboxes first hand. 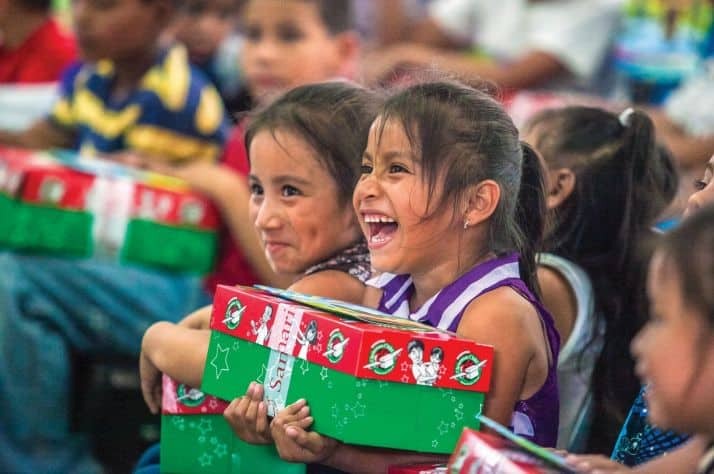 Since 1993, the Samaritan’s Purse project Operation Christmas Child (OCC) has collected and delivered more than 135 million gift-filled shoeboxes to children in more than 150 countries and territories with the help of more than 500,000 volunteers worldwide. And, as November rolls around each year, the residents of the Swan River Valley do their part to pack an average of 600 of these boxes annually. So, what happens after those boxes leave our community? Local OCC Logistics Coordinator Diane Buhler and her daughter Kirsty made the trip to Dakar, Senegal, from July 4 through 18 where they were able to experience it first hand. “Normally I am only responsible for ordering the shoeboxes and getting them into the stores and then collecting and shipping them to Winnipeg,” said Diane Buhler. “But, the area coordinator from Winnipeg has been wanting to do a distribution trip with other regional leaders for few years now and she has been working to get it arranged. Each participant on the trip was required to raise $3,500 to cover flights from Toronto, Ont., to Senegal and back, as well as everything while they were there – food, transportation and accommodations, as well as ground costs of getting the boxes to each distribution site. “On top of that, we had to pay for our vaccinations, our flights from Winnipeg to Toronto and back, as well as our travel costs from here to Winnipeg and accommodations,” said Kirsty Buhler. “We met up with everyone in Toronto and our team consisted of people from Calgary, Alta., through to north of Thunder Bay, Ont.. We had a chance to exchange names and do a little ice breaker before we headed out on our two flights – the first to Brussels, Belgium was eight hours and the second to Dakar was six. “Once in Africa, we stayed at a guest house in Dakar through our entire stay and all our distributions and events took place within a three hour radius of there,” Kirsty continued. Every day the group had two events that they attended. “We would wake up and have breakfast together as a group, have some devotions and talk about what we were going to be doing that day before getting on the bus to go,” said Diane Buhler. The Buhlers noted that a graduation ceremony is another step in the program that a child can choose to take part in. “After the children receive a shoebox, they are invited to go through a 12 week discipleship program where they learn more about the Bible,” added Kirsty Buhler. At each distribution the group participated in, anywhere from 150 to 600 pre-registered children would be provided a shoebox with nearly 3,000 boxes being handed out by their group alone. “I was in tears the second we walked into the first distribution,” Kirsty Buhler said. “I was so overwhelmed with the experience. “Some of these children have never received a gift in their life and some of them have nothing – just the clothes on their backs – and maybe not even enough food for a day. They are very poor. The group takes time with the children, telling the story of Jesus and the Bible and bringing hope by spreading the message of God’s love, which often includes a booklet explaining the story of the Bible. They then provide the shoeboxes, noting that they are a symbol of the greatest gift that God gave to the world in Jesus. “Most of the children do not realize that they are going to be getting a gift,” said Kirsty Buhler. “Their reactions vary – some are very overwhelmed and don’t really know how to take it and others are just so excited that they tear into their box and the smiles are incredible to see. “Sometimes we had the opportunity to play with the children first,” added Diane Buhler. “We had brought along a couple of suitcases worth of frisbees, soccer balls, skipping ropes, bubbles and nail polish, and at each place we would leave sports equipment and activities for that church or school to use in the future. Despite the thousands of children the group was able to reach, they couldn’t help but feel that it wasn’t enough. “Because we have travelled a lot, I wasn’t shocked at what I saw in the level of poverty,” said Diane Buhler. “But, when you see an 8’ by 10’ three walled house with no roof, a few foam mattresses in the corner and find out that is a house for eight or 10 people, it hits home. “Then, to be reminded that many of these children have never received a gift of any sort, you realize that there aren’t enough boxes to go around. There will never be enough. Diane Buhler noted that she would love to promote the program more and get more support from the community because now she has seen just how much of a difference this makes. “We need more boxes,” added Kirsty Buhler. “If you normally pack one, then pack two or, better yet, five. The most basic things like a facecloth, toothbrush and a bar of soap, a spoon or fork, school supplies and a few little toys make all the difference. “We had the opportunity to personally pack a box and give it to a child of our choosing at a distribution. I chose a little boy who, at first, wasn’t engaging with the items he took out of the box until he picked up a shoe I had filled with matchbox cars. To us these shoeboxes are such a small, relatively inexpensive thing but it means the world to a child that has nothing else. “My first day back at work last week, I felt like I was in a fog,” said Kirsty Buhler. “I feel like I don’t belong back at home and that I’m on this middle ground. I’ve seen so much and now I’m back home and I feel like a stranger.